At our school we use Investigations for math. One thing I love about the program is that it usually digs into the why of each math concept instead of just the how. It encourages students to create their own strategies for solving problems, emphasizing that there is not just one way to come to a solution. 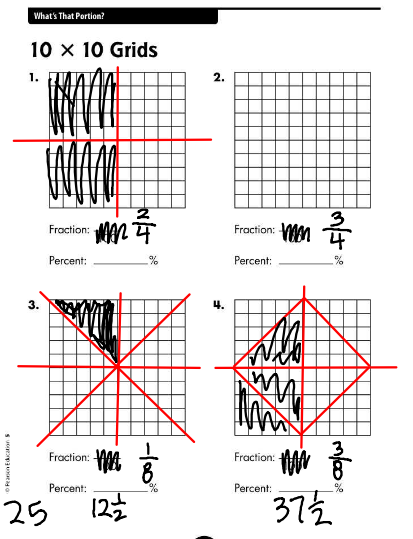 In the case of our fraction/decimal unit that we’re in now, we are doing more than just learning the rote definition of a fraction and coloring in fractional parts of pictures or just adding or subtracting them using the method I directly taught them–like I know I did in 5th grade. Instead, we are investigating and creating and figuring out and–most importantly in my opinion–using what we already know to discover something we don’t. 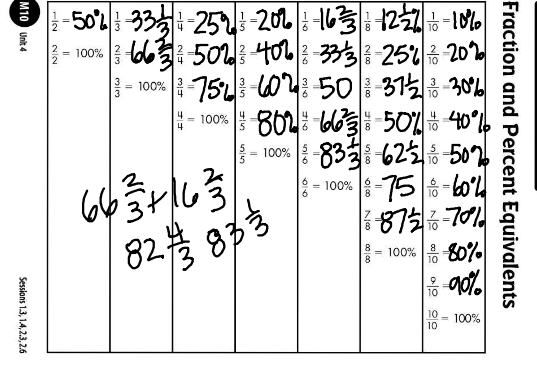 We used this visual, and what we knew about fractions and percents already to figure out that 1/8 is equivalent to 12 1/2%, because 1/4 is 25% and an eighth is half of a fourth. Our music teacher, Mrs. Kesler, will be tickled to know that I even had one kiddo make the connection between this and what he knows about music notes to help him figure it out. So after the initial idea of fraction and percent equivalents was presented, they were to dig in a little deeper. I gave them a chart to fill in, that had lots of other fractions to work with. I told them to fill in all that they could with the directions to NOT do thirds and sixths, that we’d do them the next day. But what they did instead, was make it their goal TO DO the thirds and sixths. In this case I didn’t really care that they did the opposite of what I said, because it meant that they were going to try something that might be a challenge, might stretch them a little, might give them questions to ask when we worked on it together. The thing that I think is really remarkable about the thinking behind this is that they are already getting comfortable with going back and forth between fractions and percentages, and can tell you how that relates to a group of things, like how getting 10 out of 20 of your spelling words right is 50% or that 3/4 of a class of 24 is 18. There is understanding being created that goes far beyond just memorizing definitions. I like that. And they like it, too. Posted on November 12, 2011 by Jen Bearden	• This entry was posted in Classroom, Math, Uncategorized and tagged decimals, fractions, Investigations, math, music, percents, read-aloud, thinking. Bookmark the permalink. Is the connection to music three eight notes instead of 3/8? No problem. And what prompted your name change, Archinator?